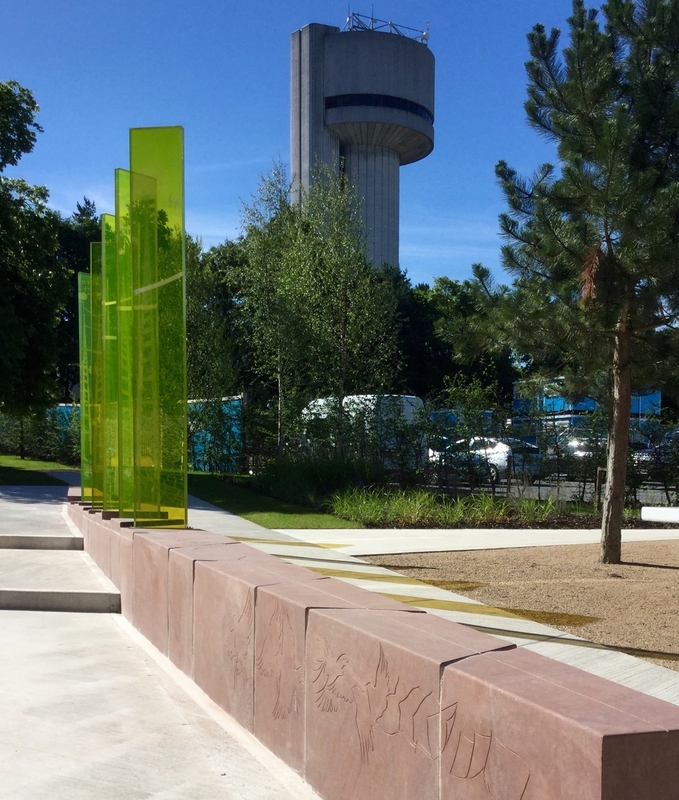 The creation of a linear park, with a pathway that leads you through a story of science crafted in glass, stone and steel and integrated into a shaped landscape. 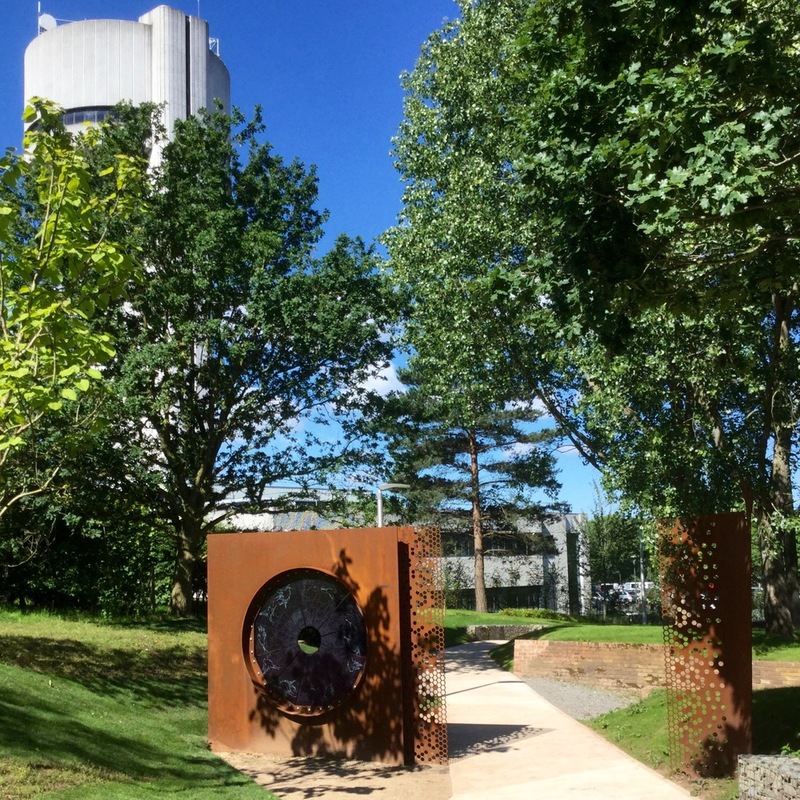 It is a ‘pathway of progress’ as you walk out from the heart of the science park with five feature gardens. It is a welcoming ‘gateway into wonderland’ when you arrive at the park. Our designs have kept true to one controlling theme, that both relates to the remarkable work at Daresbury and the association that science in general sparks for us: light. Light is our controlling theme in two ways: as a formal principle and as a metaphor. As a formal principle all of the pieces make use of light in some way. As a metaphor, light as ‘enlightenment’ suggests to us a clutch of related themes we are keen to convey. The path through the park carries the idea of a pathway of light. We have arranged 5 colours in the order they appear in the electromagnetic spectrum. Working outwards from the ‘square’ we come first to a red seating area, then to a yellow, then green, then blue and lastly violet. Red seems to us the earliest, the most elemental of the colours - it suggests to us something of birth and of the dawn of civilisation. Violet seems to us the most modern, the most electric of the colours. We feel this arrangement somehow fits with our desire to have a loose chronology running through the site from the centre outwards. 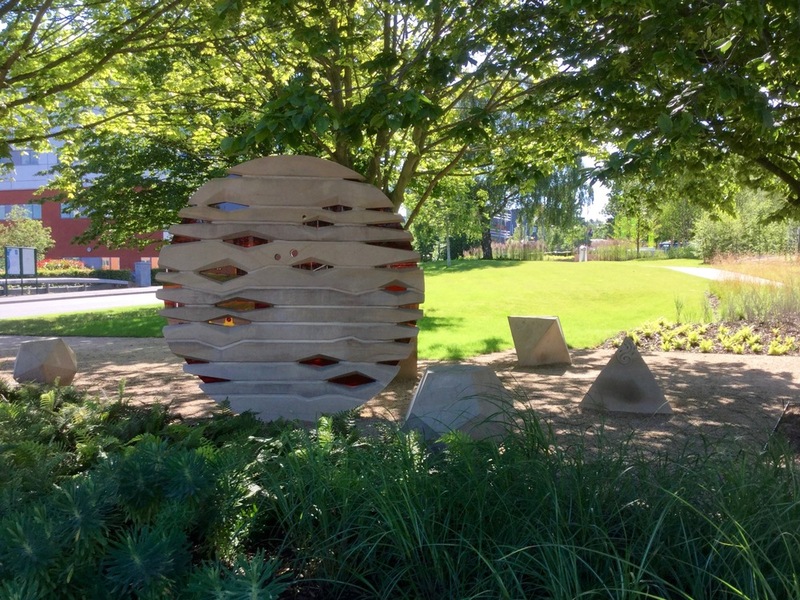 The artworks have been crafted simply from glass, stone & steel. This simple palette allows the imagery to shine. 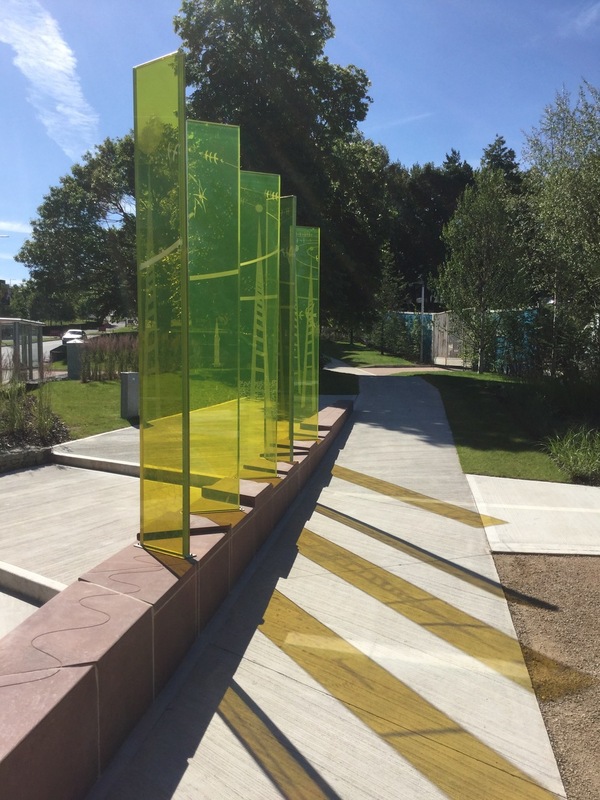 Glass has allowed us to create permanent colour within the park, which either casts coloured shadows in the sunshine, or captures the movement of the clouds on an overcast day. A circle of deep red glass encased within fractured sandstone blocks conveys the idea of beginnings, fire, destruction and creation, death and rebirth. Early observations of our world can be seen in the arrangement of a star constellation carved into the stone circle. The carved stone ‘Platonic Solids’ have other symbols carved into them; the Cube relating to the earth, Tetrahedron to fire, Octahedron to air, Dodecahedron to the universe and Icosahedron to water. The arrangement of the blocks together with the circle create in the landscape a setting like that of a settlement with a camp fire. An open and active space nearest the bus stop, with a space for play. 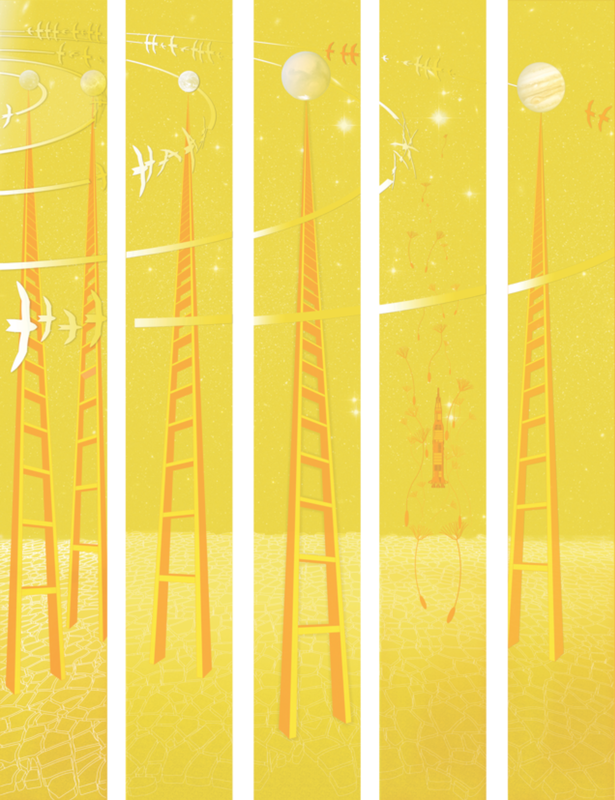 Five illuminated shoots of yellow glass, like sails on a boat speak to the viewer of spring, the earth, the land, action, the energy of youth and our attempt to impose order on the world. Abstracted patterns and illustrations span up and across the glass uprights, closing together as one canvas from certain viewpoints. 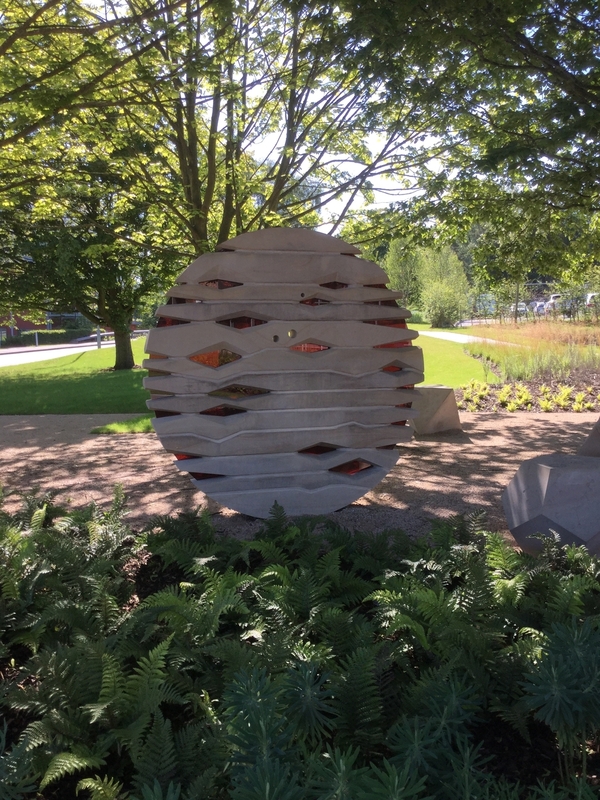 The designs also reference ideas of orbits and gravity and continue with carvings in the sandstone, including Maxwells equations and images symbolising scientific papers taking flight, using the recurring bird theme inspired by Arthur Dooley’s ‘Splitting the Atom’ sculpture. 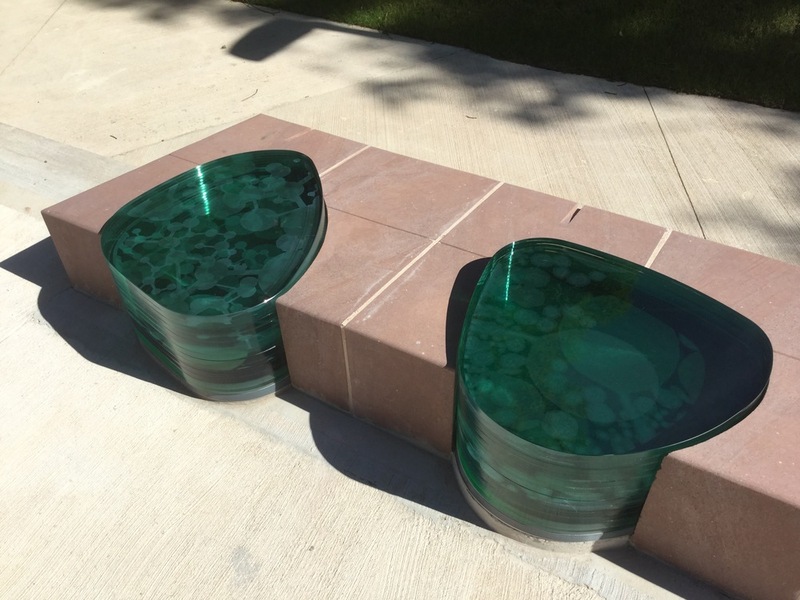 A more enclosed space where organic shapes of illuminated stacked glass, held within carved sandstone, cause the viewer to look inward, referencing ideas of the growth of organisms, of water, foliage and tendrils. 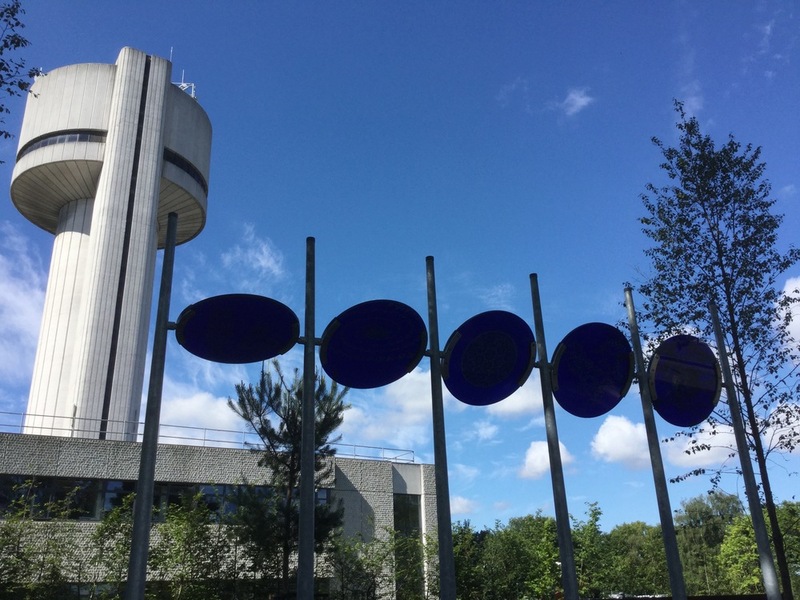 The glass designs are taken from the Daresbury Laboratory archives, and make reference to its scientific breakthroughs in molecular imaging, allowing us to view DNA structures, single protein molecules, viruses and enzymes. The idea is supported in the carving of more birds in their ‘flight of progress’ through the park while showing the birds anatomy as though passing through an X-ray. A small more secluded space with trees and decking. 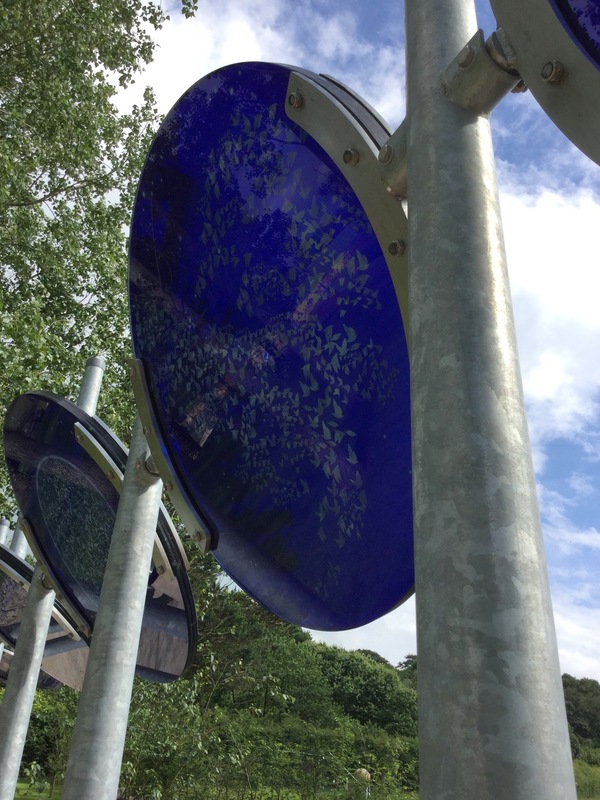 A line of five blue glass discs look to the sky elevated on posts. They are tilted to different angles and viewpoints, projecting blue ellipses on the ground. The mood for this colour is reflection and simplicity, a meditation on the natural order, seeking the spiritual. We see the circles of colour as views through to another place, looking out to the universe while telling a story about the diversity of our own planet. Illustrations within the glass show changing formations of just two kinds of birds, a hydrogen bird and a helium bird and the resulting birth and death of a star that culminates in our own blue planet, seen in the fifth disc. 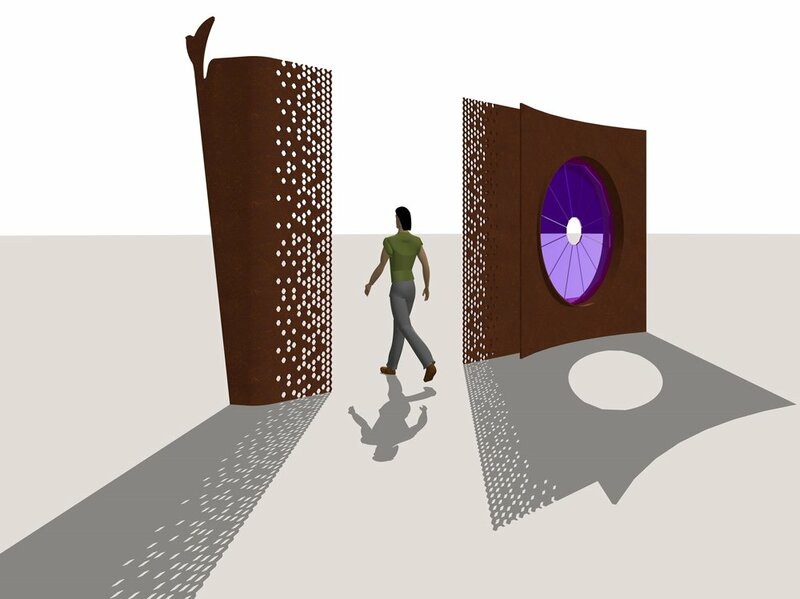 The violet garden is an entrance and exit space, a portal into and out of another realm, a 'gateway to wonderland'. Its atmosphere is electric, energised, highly charged. Rolled weathering steel sheets support this illuminated glass portal, with a design in the glass holding a complexity so fine it looks like chaos, patterning beyond our ability to see patterning at all. The patterning is taken from the seemingly random collisions of particles within an accelerator, with a distinctive image of the Higgs Boson particle ATLAS experiments. Encircling the pattern is a ring of musical notation, birds are seen as the notes, but also as scientists playing a part in the transmission of knowledge from one age to another. The movement of the bird in flight makes a link to the ‘molecular movie effect' developed at Daresbury in its new accelerator technology. 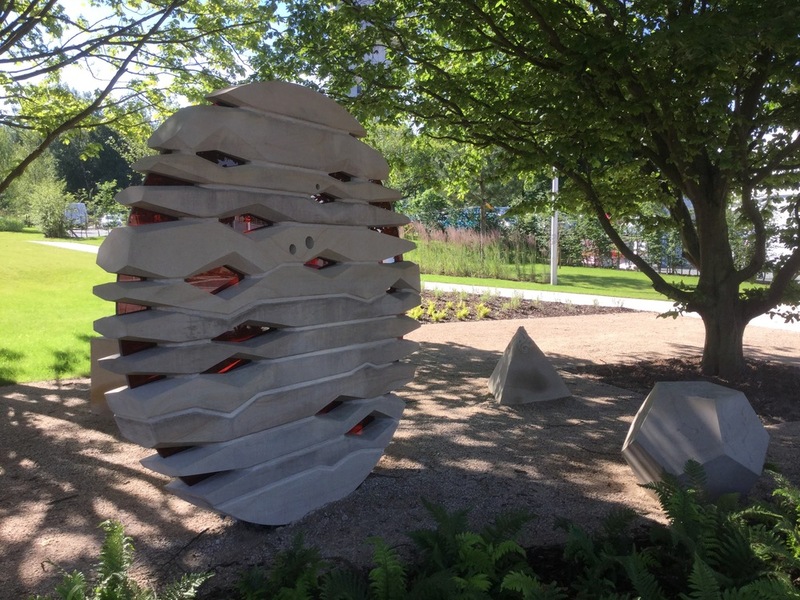 It’s been a very significant project for the studio because of the connection to the sculptor Arthur Dooley, who in 1971, created the ‘Splitting of the Atom' sculpture. His sculpture includes ten tons of magnetic steel and two thirty-seven inch pole tips, designed by Sir John Cockcroft and taken from the first cyclotron to operate outside of the USA , with data produced on the properties of neutrons used in the development of the first atom bomb. Arthur assembled these elements to represent a beam splitting the uranium nucleus, adding a dove of peace emerging among the fission products and emitted neutrons. His vision was for it to be set in a Japanese garden with the pole tips symbolising the mushroom clouds of Hiroshima and Nagasaki. We’d love to see Arthur’s piece restored and re-positioned at the heart of the site. It expresses the theme of light as power - a message both exhilarating and cautionary.